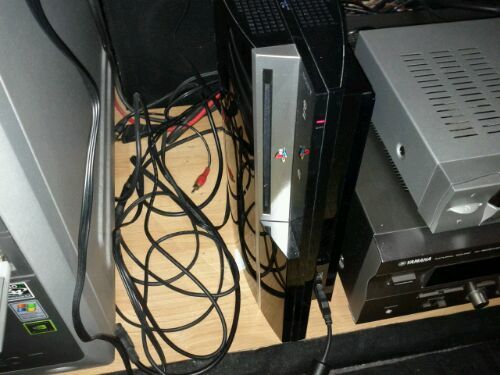 And yesterday another PS3 jumped the shark. There was something special about it: It was MINE! They are dying like flies. You know when everybody talked about the dying XBox360's? Forget about that. If you enter "Red flashing light ps3" on Google, you soon will find, that after 2 years, they all dying. That was at least for the old models with 40GB and 60GB. And mine was such a model. I was just booting up GTA IV and wanted to play as the PS3 beeped and shut down. Every attempt to switch it on again, failed, resulting in a flashing red LED. Boom. Gone. There is not even a second to think about a replacement console or a new one. I'm not friendly to Sony at the moment, because of that PS3-Hacker incident. But hey, I'm not spending money for crap to replace crap. I'll take a look on an unofficial repair service which will fix it for a good price. If they can't, that's it with the Playstation for me then. I could just wait a bit longer and grab the next gaming-console from Microsoft. [Update: Or get the new Nintendo console]. Meanwhile the Wii will do the trick. Working everyday for a much longer time, and no problems there. Cutting edge vs. quality.